Romwe was established in the 2009's Christmas night. Just within half a year, Romwe has changed from a simple vintage specialty shop into a pint-sized platform of high-street fashion. Under the accelerating development of information today, FASHION, known widely by those SWEETS, no longer only belongs to the editors or stars. In latest five years, more and more accesses are made towards the street talents, for instance, LOOKBOOK.NU and chictopia and so on.Runaway is no longer the only origin of fashion inspiration. In the next 5-10 years, or even half a century, the streets will become the exclusive type of an important trend. Wherever you are in a small village in Switzerland or in the fashion capital New York, whether you are a student with a love of fashion or a fashion blogger, in the absolute world, the street is runway, where you can prove to the whole world that "I am a fashion girl" with your styling inspiration and cameras. So of course, there must be Romwe collections in your extraordinary wardrobe. 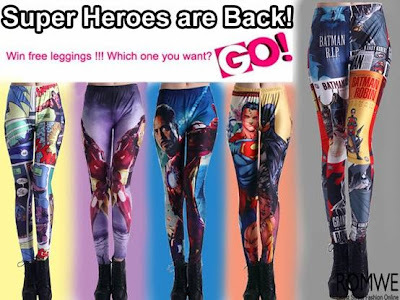 WIN IT: One (1) winner will receive a pair of Romwe super hero leggings. THE FIRST THREE OPTIONS ARE MANDATORY! YOU HAVE TO DO ALL OF THEM! * I wasn't paid or didn't receive anything. I'm not responsible for the shipping of the prize. I'm not affiliated with this company. If I had the chance to win I would choose the first one at the right! 1st one I'd like to win! I think I'd choose the one on the right edge of the picture. Definitely the Batman & Robin leggings on the right. I love either the first one or the last one !! Romwe - Talia's Charity Sale Is Online! #4 I Hate Companies That Don't Send the Items! Romwe Charity Sale of Talia's Design! #3 I Hate Companies That Don't Send the Items!